In a post-apocalyptic world, where the Earth has been overrun by the forces of evil, one man rides from city to city in a search for survivors. One man is a beacon of hope for the hopeless. 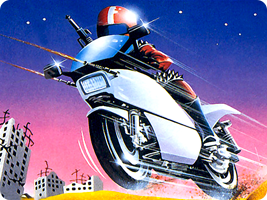 You are Mach Rider. In this racing-action title, you have to get from sector to sector within the time limit, blasting enemies off the road and dodging obstacles such as barrels, oil, tacks and icy slip zones.